Following on from the rather successful Far Cry 3: Blood Dragon spin-off, RedLynx’s Trials series is the surprising choice to carry on the Blood Dragon name. Indeed it gets the full treatment complete with tongue-in-cheek takes on the 80’s with pop-culture and cheesy movie references and quotes, over the top action and larger than life characters all to a neon backdrop. Trials of the Blood Dragon is one of many spin-offs of the Trials series, but is only the second Trials title available for current generation consoles following the release of the highly praised Trials Fusion in 2014. Blood Dragon, however, aims to be a more accessible and experimental Trials game compared to previous titles: content has been stripped back (there’s no more unlocking bikes, you use the one you’re given) and the game itself is considerably shorter too. Trials of the Blood Dragon continues the long tradition of tasking players to negotiate their motorised bike through a plethora of ramps, flips and obstacles on a two-dimensional plane by good use of the accelerator, brake and by shifting your rider’s weight both back and forwards as needed. Completing levels is very much a case of trial and error. It’s handy, then, that your progress is saved every time you pass a checkpoint. Once you crash out, a simple hit on the reset button will spawn you back to your previous checkpoint. It’s this quick reset back into the action which makes the game hard to put down at times – much like what we’ve recently experienced with Trackmania Turbo. Once you’ve completed one of the game’s often pretty and colourful 27 levels on offer you’ll be given a grade which takes into account the time remaining as well as how many times you needed to hit that reset button. You can perfect your grade by replaying levels over and over looking for that elusive crash-free run if you are so inclined, although admittedly I had no great enthusiasm to do so outside of the first few levels. 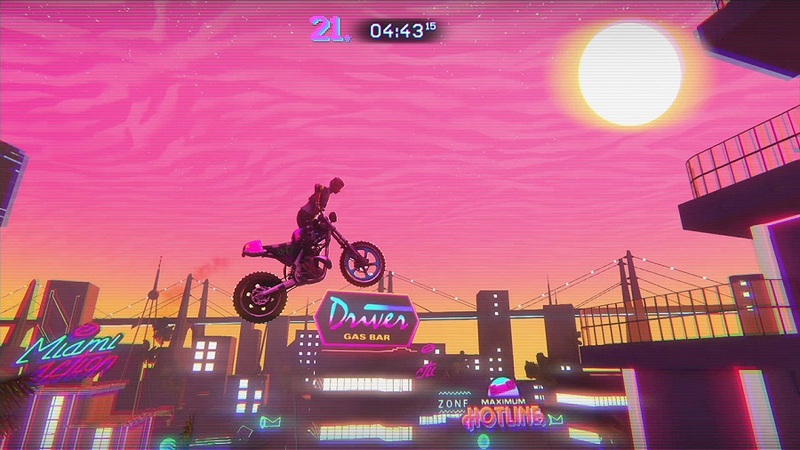 Trials of the Blood Dragon controversially breaks up the on-bike action by offering the player on-foot platforming sequences. Early on these sequences are sporadically introduced and feel basic. As you progress through the game however these platforming sections get more and more frequent, complex and challenging. You’ll be expected to duck under obstacles, jump from platform to platform, interact with terminals, push boxes and shoot objects and enemies to proceed. This may sound fun, but in reality, it very much takes you out of the flow of the on-bike sections which, needless to say, are where the most fun in the game is had (this is a Trials game after all). These platforming sections wouldn’t be too tiresome if they just made up a small portion of the playing time, but this is sadly not the case. It would probably not be a stretch to say that about a third of the game is taken up by these platforming sequences. 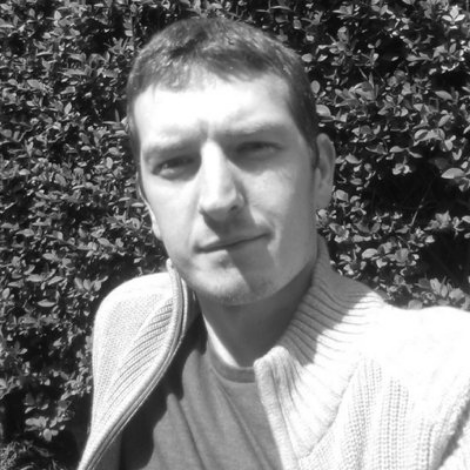 The platforming in later levels, in particular, require a lot of skill which will no doubt frustrate players – so much so in fact that I can easily imagine many struggling enough to consider giving up on the title altogether. Platforming aside, some of the other non-bike content fares much better. The grappling hook which sees you swinging from object to object, can be a lot of fun and requires some finesse. Developer RedLynx also include segments which involve driving an eight-wheeled tank-like vehicle, a remote-controlled car, and even mine carts to good effect. The eight-wheeled vehicle feels heavy and purposeful and provides a satisfying feeling of power when smashing through walls and causing general havoc. 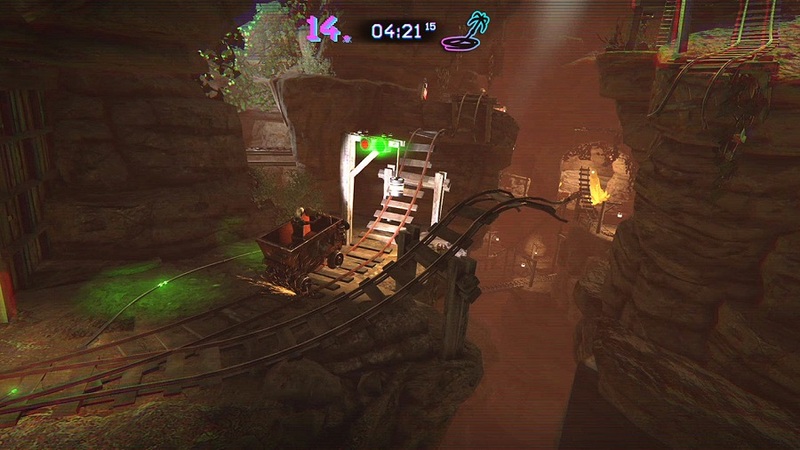 The remote-controlled car sections require you to use both shoulder buttons to propel the vehicle forward depending on which way it’s currently facing and requires some thought, whereas the mine cart sequences were fun and brought back memories of the mine cart madness level from Donkey Kong Country albeit on acid. Every so often you’ll also get the chance to don a rocket pack too which can be very challenging to control and will make for some interesting, if not hair-pulling, moments depending on your skill level. Trials of the Blood Dragon is very much a stripped down and experimental Trials game with some elements faring better than others. The level design is generally very impressive with the title offering some truly memorable and unique moments like when your character is tripping on a large dose of turbo crank for instance. The soundtrack is also a highlight and helps to keep you invested in the game despite the less than stellar storyline. As an experimental concoction, RedLynx has got the dosage wrong. You are too often yanked out of the fun and satisfying bike segments and put into these less than inspiring on-foot platforming sequences which spoil the flow of the game and feel bland, boring and superfluous. I can appreciate the fact that RedLynx is trying to inject some new flavour into their Trials series, but ultimately the game would have been superior if it had stuck to the tried and tested formula of previous titles. Trials of the Blood Dragon is very much a stripped down and experimental Trials game with some elements faring better than others. The level design is generally very impressive with the title offering some truly memorable and unique moments. The soundtrack is also a highlight and helps to keep you invested in the game despite the less than stellar storyline. Unfortunately, You are too often yanked out of the fun and satisfying bike segments and put into these less than inspiring on-foot platforming sequences which spoil the flow of the game and feel bland, boring and superfluous.